3D EFFECT - a flat acrylic plate that creates a hologram-like illusion image. 7 COLOR SETTINGS AND 2 MODES - Change the color of the light into Red, Green, Blue, Yellow, Cyan, Purple and White. Modes are STEADY and ALTERNATE. SAFE AND EFFICIENT - shines bright but consumes a little power to operate. LED can operate up to 10,000 hours and never worry of overheating. TOUCH CONTROL - turn on/off or change color mode easily with just a touch for your convenience. USB POWERED - plug it on your laptop, powerbank or your smartphone's USB charger using our 2M length USB cable. 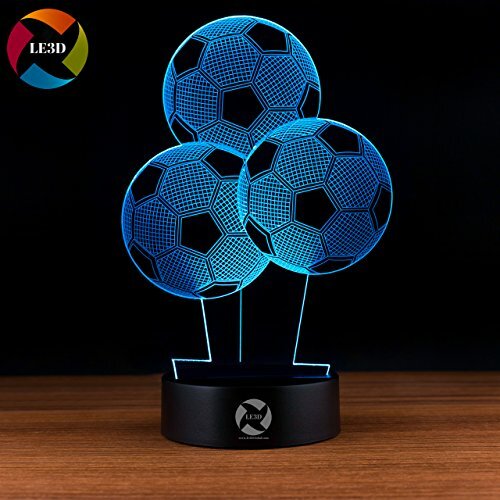 3 Soccers Themed 3D Illusion LED Night Light/LED 3D Desk Lamp: MIND BENDING 3D ILLUSION LIGHTING! How It Works: This impressive 3D night light lamp has been crafted from a flat (3 mm) acrylic glass plate with a 2D laser engraved image of 3 Soccers on its surface. Once the flat plate is inserted into the round lamp base, the 9 LED diodes at the bottom of the lamp base distribute the light in a way that creates a spectacular 3D effect. - 7 Colors Change: Red, Green, Blue, Yellow, Cyan, Pink, White. - Smart Touch Button: Simply touch the button on the illusion 3D lamp to change from color to color. 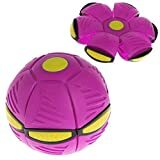 The 8th touch will be 7 colors gradual changing.The last touch will act as Off Button. - 1 x USB cable (Does not come with a Wall Plug, you can use ANY plug that you have) (31 inches long). - 1 x LED 3D illusion lamp user manual. NOTE: Acrylic board sided with a protective film, please remove the protective film from BOTH sides of the plate before use. We are a small Orlando based family business and our passion is to find the hottest trends and deliver to YOU.